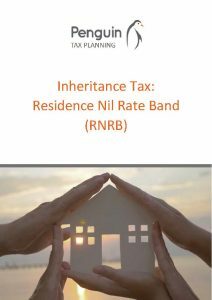 In April 2017 a new additional allowance was introduced called the Residence Nil Rate Band allowance. This potentially produces an additional £175,000, per individual, or £350,000, per couple, of Nil Rate Band. This can only be offset against residential property and is only applicable where the property is left to direct descendants. However welcome this new rule is there are multiple aspects to this which any individual or couple may need to consider or deal with. It could impact or affect existing planning arrangements and even require adjustments to an existing will or trusts. It is not as straightforward as it may first seem and even HMRC, on their own web site, suggest individuals/couples should seek appropriate advice from a specialist. By downloading this brochure you are consenting to marketing by both email and telephone from Penguin Tax Planning, we will not share your data under any circumstances without your express permission.